As you were aware, recently the A1200.net team had launched their newest crowd funding campaign for new compatible A500 and A500+ cases, aiming to either reach that $155,000 goal or smash it for even further case colours and even a new mouse tank case. 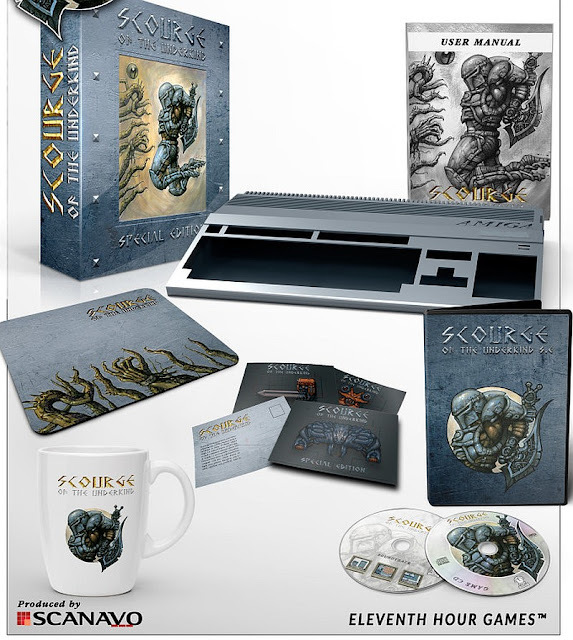 Well it looks as if the campaign has had a much needed kick up the backside, because not only can you pledge for special editions such as bronze, silver, gold, Apollo or Vampire SE but Eleventh Hour Games has joined the campaign with their rather awesome Scourge of the Underkind Collectors Edition! During 2016 and into 2018 Wayne Ashworth, Magnus, Vedder and Triace Desire had been developing a new game called ' Scourge of the Underkind ' for 1 Meg OCS Amiga's and above. It was shown off many times as a rather wicked looking top down arcade action game with coin and key collection that is very similar to that classic game Chaos Engine. Fast forward to today however and the game looks better than ever as putting aside the awesome Amiga case pledge pack seen above, the latest trailer give us an update of extra enemies, extra levels, an extra boss and even box art for the game itself. So as you can see not only is the campaign looking great so far, but it also supports a brilliant new game that is still in development.